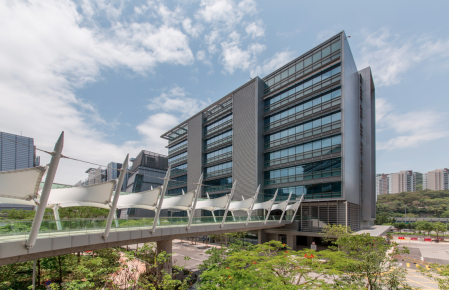 Hong Kong Science and Technology Park is well known for being a world-class infrastructure and support services to science and technology companies. It's one of the reasons Hong Kong is emerging as a tech and startup hub for Asia. 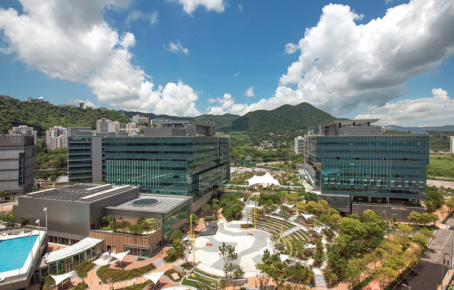 With the completion of its latest new section, the Park will become home to a whopping 600+ companies and 15,000 technology talents, local and global. Not surprisingly, there's a focus on green and clean tech there, as rapid-growing sectors. As such, the recently completed new development, sexily name "Phase 3" (hey, they're into science, not marketing), is described as a “living laboratory”, where the buildings are "designed on sustainability principles and make use of three key design principles of reduction, efficiency and generation, to encourage smarter use of resources and a greener lifestyle at workplace." Sound cool? It gets better. To help get the public and visitors more familiar with the many innovations they've put in place, the Science Park has embedded a funky feature into Phase 3: The 'Green Trail' walks you through 17 selected green building design features. Along the way, you can "enjoy the tranquil landscape of the Park, and at the same time, discover how technological innovations… shape our way towards a greener future." So what exactly will you see? What has earned the new building its BEAM Plus Platinum rating, LEED Platinum rating, and, most recently, a Grand Award at the Quality Building Awards? We asked Mr Ben Lui, Chief Project Officer, HKSTP. Q: Tell us about the new features of Phase 3. A: We've taken reference from world-class benchmarking, such as BEAM Plus by the Hong Kong Green Building Council (HKGBC) and successfully elevated passive sustainable building design to an exceptional level. For instance, “pay-for-use” air-conditioning was implemented to give companies at Science Park the choice to open windows allowing for natural ventilation, and the ability to manage their own air-conditioning levels and spending. In the building, renewable energy generated from the photovoltaic (PV) panels is fed into the electricity grid, thus reducing the load on the existing grid and the level of CO2 emissions. All 350 parking spaces for Phase 3 (100%) provided with Electric Vehicle (EV) charger. We also have a Rainwater Collection System to minimise water demand for landscape irrigation. Q: What makes this Phase different from previous ones? 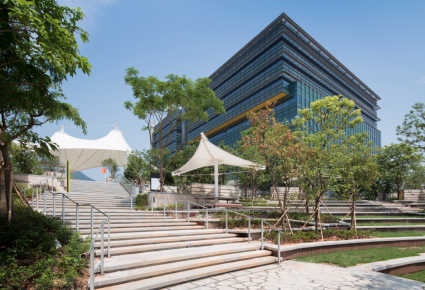 A: Designed with the principles of “reduction, efficiency and generation” in mind, all buildings in Phase 3 embrace the latest green technologies and cost-effective energy-saving measures, making it the largest applications of green technologies in Hong Kong. Take the lobby for instance. Contrary to conventional main entrance lobby design, an 'Open Air Lobby' at Phase 3 is semi enclosed to enhance the integration of outdoor and indoor environment. It features Solar Tracking Operable Louvres that adjusts according to different time of day, as well as a 'Smart Lighting System' - 100% LED office lighting with sensors, to save energy. Throughout the building we have installed a sophisticated Energy Performance Monitoring System (EPMS) to display real-time consumption in energy, enabling Science Park companies to make informed comparison and decisions about their energy use. We want to demonstrate how sustainable building practices and green technologies can be applied to construction projects in Hong Kong for the greater benefit of a building’s performance, and the health of the community as a whole. For details on the Green Trail or to book a tour, visit the website.